Daniel Lopatin (born July 25, 1982), best known by the recording alias Oneohtrix Point Never (also styled 0PN), is a Brooklyn-based American composer, producer and singer-songwriter of experimental electronic music. He began releasing synthesizer-based recordings under the moniker in the mid-2000s, receiving initial acclaim for the 2009 compilation Rifts. He subsequently explored varied approaches, including sample-based composition and MIDI production, on albums such as Replica (2011), R Plus Seven (2013), and Garden of Delete (2015). In 2011, he founded the label Software, a subsidiary of Mexican Summer, and in 2013 he signed to British electronic label Warp. Lopatin has collaborated with artists such as Anohni, Tim Hecker, Ishmael Butler, David Byrne, Iggy Pop and FKA Twigs. He has also participated in several side projects throughout his career, including the duo Ford & Lopatin and his influential alias Chuck Person, and has contributed scoring work to films such as The Bling Ring (2013) and Good Time (2017); the latter won him the Soundtrack Award at the 2017 Cannes Film Festival. Born and raised in Massachusetts, Lopatin is the son of Russian Jewish "refusenik" emigrants from the Soviet Union, both with musical backgrounds. Some of his first experiments with electronic music were inspired by his father’s collection of dubbed jazz fusion and Stevie Wonder tapes, and his Roland Juno-60 synthesizer, an instrument that Lopatin would inherit and go on to use extensively. In high school, Lopatin played synthesizer in groups with friend and future collaborator Joel Ford, performing at school events. Lopatin attended Hampshire College in Massachusetts before moving to Brooklyn, New York to attend grad school at Pratt Institute, studying archival science. During that time, he became involved in Brooklyn's underground noise music scene. Lopatin initially released music under a number of aliases and as part of several groups, including Infinity Window and Astronaut, before adopting the pseudonym Oneohtrix Point Never, a verbal play on the name of the Boston FM radio station Magic 106.7. Early OPN recordings drew on synthesizer music, '80s new age tropes, and contemporary noise music. Lopatin released a series of cassette and CD-R projects interspersed with a trilogy of full-length albums: Betrayed in the Octagon (2007), Zones Without People (2009), and Russian Mind (2009). Much of this material was eventually collected on the 2009 compilation Rifts, which brought him international acclaim; it was named the second-best album of 2009 by UK magazine The Wire. Also in 2009, Lopatin released the audio-visual project Memory Vague, which included his profile-raising YouTube video "nobody here". His work during this period would be associated with the early 2000s underground hypnagogic pop trend. In June 2010, Lopatin followed Rifts with his major label debut Returnal, released on Editions Mego. In the same year, he released the influential limited-edition pseudonymous cassette Chuck Person's Eccojams Vol. 1, which would help inspire the 2010s Internet-based genre vaporwave,  and he formed the duo Games (later renamed Ford & Lopatin) with childhood friend Joel Ford. Lopatin's next album, Replica, was released in 2011 on his newly formed label Software Recording, to further critical praise. On it, Lopatin developed a sample-based approach that drew on the audio of 1980s and '90s television advertisements. Also that year, Lopatin participated in the collaborative album FRKWYS Vol. 7 with musicians David Borden, James Ferraro, Samuel Godin and Laurel Halo as part of RVNG's label series; Ford & Lopatin released Channel Pressure, and OPN was chosen to perform at the All Tomorrow's Parties festival. Lopatin and visual artist Nate Boyce collaborated on the 2011 Reliquary House performance installation; the music from this project would later be released on the split OPN/Rene Hell album Music for Reliquary House / In 1980 I Was a Blue Square (2012). In 2012, Lopatin collaborated with Tim Hecker on the album Instrumental Tourist. 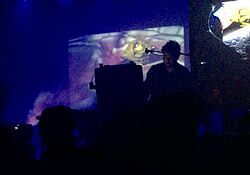 OPN performing in New York in 2016, with visuals by Nate Boyce. In 2013, Lopatin signed with Warp Records. His label debut, R Plus Seven, was released on September 30, 2013 to positive reception.Lopatin collaborated with several artists on visual accompaniments, live performances, and internet projects for the album, among them his frequent collaborator Nate Boyce; Jon Rafman; Takeshi Murata; Jacob Ciocci, and John Michael Boling. Also in 2013, Lopatin composed his first film score—for Sofia Coppola's film The Bling Ring, a collaboration with Brian Reitzell—and OPN participated in the Warp x Tate event and was commissioned to create a piece inspired by Jeremy Deller's The History of the World. In 2014, Lopatin supported Nine Inch Nails on their tour with Soundgarden, as a replacement for Death Grips. On October 4, 2014, he presented a world premiere live soundtrack for Koji Morimoto's 1995 anime film Magnetic Rose. The event took place at the Jodrell Bank Centre for Astrophysics, and featured Anohni on a rendition of the OPN song "Returnal" as well as audio-visual works from Nate Boyce which have been hosted by the Barbican Centre in London, the Museum of Modern Art and MoMA PS1. In the same year, OPN released Commissions I for Record Store Day, featuring several commissioned pieces. He also contributed "Need" to the Bleep:10 compilation in celebration of the online retailer's 10th anniversary. This was followed by Commissions II in 2015. Lopatin released his second Warp LP Garden of Delete in November 2015 following an enigmatic promotional campaign. He also composed the score for the 2015 film Partisan, directed by Ariel Kleiman. In 2016, Lopatin contributed to British singer Anohni's 2016 album Hopelessness and 2017 EP Paradise as well as Chicago footwork producer DJ Earl's 2016 album Open Your Eyes. In Fall 2016, UCLA's Hammer Museum hosted the film series Ecco: The Videos of Oneohtrix Point Never and Related Works, dedicated to the visual work of Lopatin and his collaborators. In January 2017, a collaboration between OPN and FKA twigs was confirmed. In 2017, OPN provided the soundtrack for the film Good Time, directed by Ben & Josh Safdie. He won the Soundtrack Award at the 2017 Cannes Film Festival for his work on the film, which included a collaboration with singer Iggy Pop entitled "The Pure and the Damned". The film's soundtrack was released via Warp on August 11, 2017. In June 2018, Lopatin released his ninth studio album Age Of on Warp. The album was accompanied by MYRIAD, an expansive conceptual live project dubbed a 'concertscape' and 'four-part epochal song cycle' and featuring collaborations with live musicians and the visual artists Daniel Swan, David Rudnick, and Nate Boyce; the project was premiered at the Park Avenue Armory in May 2018. Also in 2018, OPN collaborated with David Byrne on his LP American Utopia and added synthesizer to Ultraviolet by Kelly Moran. ^ Carter, Spike. "Oneohtrix Point Never's Daniel Lopatin on Film Scoring, His New Record, and Touring with Trent Reznor". Vanity Fair. Retrieved March 18, 2017. ^ a b c d e Phares, Heather. "Oneohtrix Point Never". allmusic.com. AllMusic. Retrieved August 12, 2014. ^ Carlick, Stephen. "Oneohtrix Point Never: Pop Will Eat Itself". Exclaim!. Retrieved March 18, 2017. ^ Sherburne, Philip. "Last Step: Going to Sleep to Make Music to Sleep To". Spin Magazine. Retrieved July 4, 2016. ^ Vida, André. "Oneohtrix Point Never on Uniting Experimental and Mainstream". Electronic Beats. Retrieved March 18, 2017. ^ Kim, Michelle (May 27, 2017). "Oneohtrix Point Never Wins Soundtrack Award at Cannes Film Festival". Pitchfork. Retrieved June 1, 2017. ^ "Red Bull Music Academy". daily.redbullmusicacademy.com. Retrieved July 27, 2017. ^ Beta, Andy (June 10, 2011). "Q&A: FORD & LOPATIN ON PLAYING TOGETHER AND PLAYING WITH STUDIO TOYS". The Village Voice. Retrieved November 29, 2015. ^ "Soundsystem Pastoral by Dania Shapes (Oneohtrix Point Never) – MP3 Release – Boomkat – Your independent music specialist". Boomkat. Retrieved August 5, 2014. ^ "Oneohtrix Point Never's Post-Modern Make-Out Music". Mtvhire.com. Retrieved October 20, 2015. ^ "Artists | Oneohtrix Point Never". WARP. Retrieved October 20, 2015. ^ Reynolds, Simon (July 6, 2010). "Brooklyn's Noise Scene Catches Up to Oneohtrix Point Never". The Village Voice. Retrieved December 8, 2015. ^ Sherburne, Philip (May 22, 2012). "Last Step: Going to Sleep to Make Music to Sleep To". Spin Magazine. Retrieved July 4, 2016. ^ "The Top 50 Albums of 2010". pitchfork.com. Retrieved August 5, 2014. ^ Whiteley, Sheila; Rambarran, Shara, eds. (January 22, 2016). The Oxford Handbook of Music and Virtuality. New York, NY: Oxford University Press. p. 412. ISBN 9780199321285. ^ Hughes, Josiah. "Daniel Lopatin, Laurel Halo, James Ferraro Team Up for RVNG Intl. 's 'FRKWYS Vol. 7' By Josiah Hughes". Exclaim!. Retrieved September 10, 2016. ^ Neyland, Nick. "Oneohtrix Point NeverRene Hell Music For Reliquary House / In 1980 I Was a Blue Square". Pitchfork. Retrieved November 18, 2016. ^ Minsker, Evan. "Tim Hecker and Daniel Lopatin (Oneohtrix Point Never) Share Collaborative Track, Album Details". pitchfork.com. Retrieved August 6, 2014. ^ "R Plus Seven – Oneohtrix Point Never Reviews, Ratings, Credits, and More at Metacritic". Metacritic.com. Retrieved October 26, 2014. ^ a b Stanley, Sean (January 22, 2015). "Listen to Oneohtrix Point Never's film score on Partisan's trailer | DIY". Diymag.com. Retrieved October 20, 2015. ^ "Oneohtrix Point Never preps comp, is recording next album". Factmag.com. Retrieved October 20, 2015. ^ FACT Team. "Oneohtrix Point Never announces new album". Factmag.com. Retrieved October 20, 2015. ^ "Oneohtrix Point Never unpicks the secrets of Garden Of Delete". Factmag.com. November 12, 2015. Retrieved June 3, 2018. ^ "Antony and the Johnsons news". Antonyandthejohnsons.com. Retrieved June 18, 2015. ^ Bowe, Miles. "Teklife's DJ Earl has made an album with Oneohtrix Point Never". Fact. Retrieved September 10, 2016. ^ "IN REAL LIFE: FILM & VIDEO, SCREENINGS Ecco: The Videos of Oneohtrix Point Never and Related Works". Hammer Museum. Retrieved November 18, 2016. ^ Strauss, Matthew. "FKA twigs Teams With Oneohtrix Point Never and Motion Graphics for New Song "Trust in Me" for Nike Video: Watch". Pitchfork. Retrieved March 21, 2017. ^ a b Bowe, Miles. "Hear Oneohtrix Point Never's new song featuring Iggy Pop 'The Pure And The Damned'". Fact Magazine. Retrieved May 17, 2017. ^ "OPN on Twitter: ""AGE OF" Recorded 2016-2018"". Twitter. Retrieved April 5, 2018. ^ "MYRIAD : Program & Events : Park Avenue Armory". Park Avenue Armory. Retrieved November 17, 2017. ^ Sodomsky, Sam. "Listen to David Byrne and Oneohtrix Point Never's New Song "This Is That"". Pitchfork. Retrieved April 16, 2018.